A spokeswoman said the tiger was stressed from the events but by Wednesday morning, he had settled down quite a bit. MURCHISON, Texas — After a hectic couple of days the tiger rescued from a home in southeast Houston is now resting at a sanctuary in north Texas. The 350-pound male tiger was taken to Cleveland Amory Black Beauty Ranch in Murchison, Texas on Tuesday. A spokeswoman for the ranch said the tiger appeared to be very stressed over the past couple of days but by Wednesday morning, he had settled down quite a bit. The tiger, named Tyson, was a little overweight when he was found, officials said. He appears to be in good health otherwise, but will still be placed in quarantine for a minimum of two weeks. 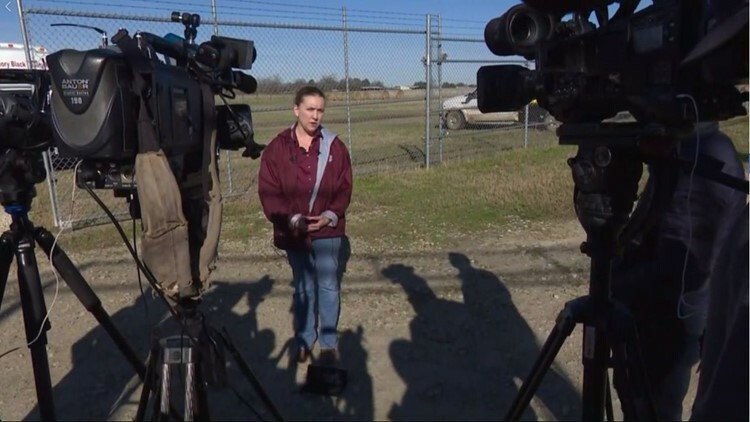 A spokeswoman for Black Beauty Ranch speaks to the media during a press conference Wednesday morning. The spokeswoman said when he was released into an enclosure on Wednesday, it seemed he was getting used to touching grass for the first time. Staff at the ranch are hoping Tyson can call the place his forever home. "So we're hopeful that this tiger will become a permanent resident here at Black Beauty Ranch. We're waiting on the courts to make that final decision. We're able to provide him a home until then, but we're hoping that he can stay here permanently." said the spokeswoman. On Monday, officials said two people went into the abandoned home in southeast Houston and found the tiger. The two people told officials they were there to smoke marijuana when they saw the cat and called 311. Tyson was taken to BARC Animal Shelter in Houston after crews received a warrant from Houston police to search the home. On Tuesday, he was transported from the animal shelter to Black Beauty Ranch in Murchison. The ranch is 1,400 acres and is home to 800 other animals, including two other tigers. The spokeswoman said people keeping tigers as pets is more common than most people think - but it's still very dangerous and unfair to the wild animal. "We see this over and over again. People think the cubs are cute and they want to play with them but they grow up. They are wild animals. They do not make good pets." said the spokeswoman. She said it will cost around $65,000 a year to feed the three tigers at the ranch. The Black Beauty Ranch is a non profit organization that relies solely on donations, the spokeswoman said. If you would like to donate to the organization visit, fundforanimals.org/blackbeauty. The sanctuary is not open to the public but they do offer a monthly guided tour. For more information, click here.